Fitzrovia has a unique character, filled with an amalgamation of spirited souls, who bring about the very best environment to live in and, continuously shaping patterns of social cohesion. 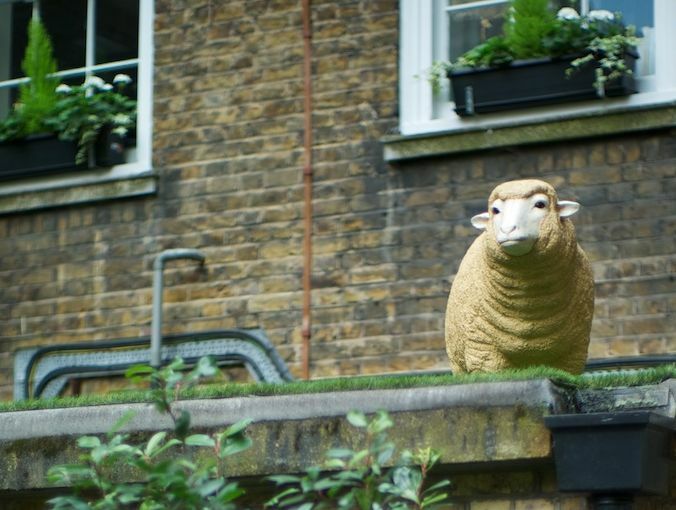 The Sheep sculpture on a green roof in the Fitzrovia Community Garden was donated by the British Library. The community centre, opened two years ago, is a result of this determined diversity. And now, the ongoing good work has transformed a dark and neglected space into a glorious community garden. It was important to create something that matched the high standards of the buildings. And with that in mind, the contributors (100 of them), fashioned an English country garden with just a smidge of Alice in Wonderland’s ‘Mad Hatter’s Tea Party’. This has been a year-long project, and its launch was attended by 250 people. It was opened by Dr Shaukat Nazeer , who started his practice in what is now the reception office of the community centre in 1974. He told us that the community centre is now part of the original nurses’ home, which was built in 1936, at the same time as The Middlesex Hospital was rebuilt. In those days many of the nurses were from very privileged backgrounds and some of them were dropped off by their fathers in Rolls Royces. The home was run by a fierce matron called Miss Bender, who took it upon herself to ensure that the girls were protected from the advances of the boys. But, regardless of the matron’s strict stance, the girls would often sunbathe on the roof, in a state of partial or total undress. Dr Nazeer (“Naz) remembers how the London plane trees in Foley Street were only a fraction of the height they are now. This emphasised that the greening of Fitzrovia is a continuing process, not one just starting. And, hopefully, future generations will make Fitzrovia even greener than it is today. Warren Street and Whitfield Street has also been part of the community garden initiative, and others will follow. Open green space is a rarity and luxury in central London, and so, there is a need to care and promote more of them, as they are so beneficial to people’s health. Greening also creates a sense of well-being and it helps bring out the best in people. If an area looks loved, it’s easier to persuade other people to love it too, and community cohesion is enhanced, leaving people with an empowering sense that they can change their environment for the better. This project was formally launched last October when Derwent London handed a very generous cheque for £30,000, with additional support from Sir Robert McAlpine, Metro Bank, Circle 33 Housing, and Fitzrovia Youth in Action. The Sheep, which is currently installed on the roof in the garden was donated by the British Library, which was previously part of the Georgian exhibition. Rousseau wrote in the social Contract, that “the common good can be reconstructed until societies get it right”. Fitzrovia is a very good example of this. The Community Centre/ Garden, amongst other projects, gels people together and this latest greening has resulted in a wonderful quiet haven, in the heart of the West End.